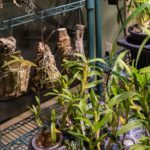 This is a simple modification that I’ve made to a number of dendrobium cork mounts and baskets, and it has dramatically improved root growth, and subsequently, cane growth. 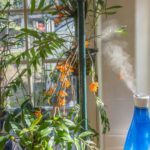 It can be an asset to growing humidity- or moisture-loving species and hybrids in a drier environment, or help maintain more even moisture with less frequent waterings. In essence, what I am doing is creating some of the characteristics of a basket on a mount by adding a large “green moss ball” to cover most of the surface of a cork mount. I credit the original inspiration for this mount to Jason Fischer of Orchids Limited. 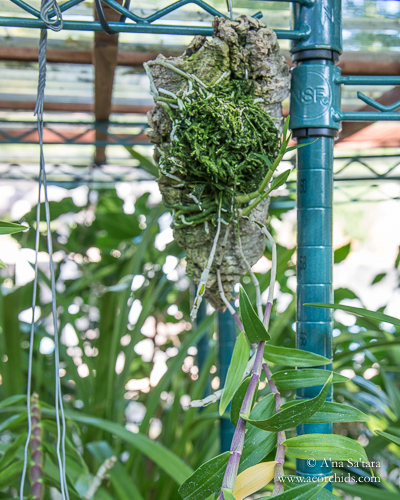 He makes what he calls a “jungle mount” — a large wire frame filled with moss where the orchids are inserted or attached to the outside, allowed to grow their roots “into the moss”, or over it, as they naturally would on a moss covered tree trunk. My husband saw some of these when visiting his nursery, and was very impressed with the results. Jason also got Paul enthusiastic about green moss as valuable for moisture retention without acidity, rot, or sogginess (compared to sphagnum moss). Green moss is not recommend as a solo potting material, but Jason grows some of the nicest vandas that we’ve seen by combining green moss with large charcoal chunks in a basket. They do not need watering everyday, or as high of humidity, as a traditional open vanda basket, and the green moss/charcoal combo does not break down over time like bark. Back the mounts. The two sets of photos hopefully speak for themselves! 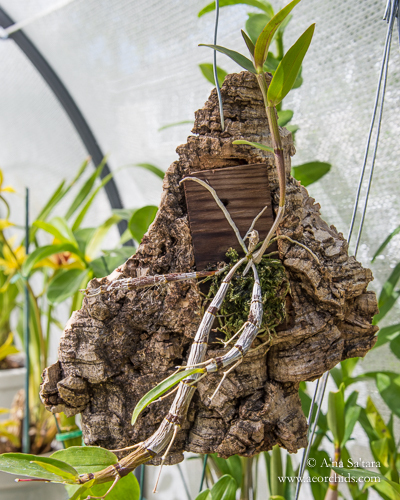 The Dendrobium unicum started with a mostly bare wood slab that we affixed to a larger cork mount as its roots spread. We then added the moss to cover most of the mount. Similar treatment for the Dendrobium Eltonese (Dendrobium papillio x Dendrobium victoria-reginae), though this one started with sphagnum moss covering the center of its cork mount. 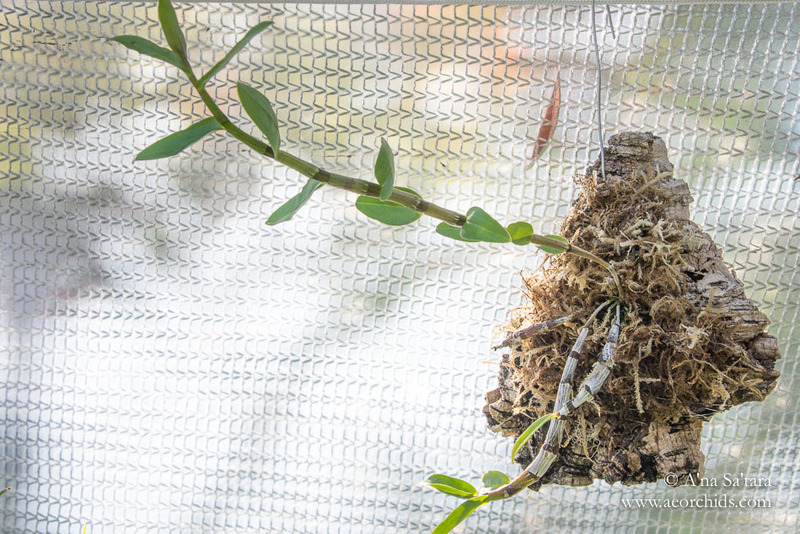 Both orchids were growing quite well before we tried this experiment, but I saw the limitations on root growth, noting that the roots didn’t venture far beyond the sphagnum moss on the Dendrobium Eltonese. Both of these are cool growers, and spend much of the year outside in the shadehouse, with lower humidity in the summer California dry season. Even with daily heavy watering, the mounts would be dry by the end of the day. Clearly adequate for sustaining the plants, but not optimal. After the moss addition, the additional root growth has been quite notable. 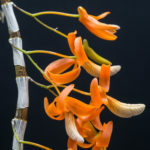 On the Dendrobium Eltonese, the roots are now popping out of the edges of the moss, after traversing the entire mount. The canes are long and vigorous as well. 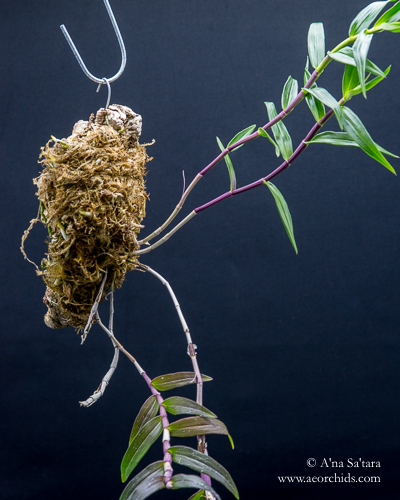 The new cane for the Dendrobium unicum, grown after the “moss ball” addition, is most telling — this year’s cane is about 12″ long, double the length of the previous years’ canes (see the photo at the top of the page). Would it be more ideal to have constant high humidity in the growing area for the mounts? Very likely. But to take advantage of our naturally cool (50F) central California nights for these cooler-growing species, they need to head outside for the summer. Outdoors, I am limited in my ability to sustain 60%+ humidity when the ambient environment drops to 30-40% humidity during the day. With the moss mounts, these dendrobiums are staying moist much longer (1-2 days instead of a couple hours). Green moss is very different than sphagnum moss; it dries more quickly, is more airy (more similar to coconut fiber), and wets much more easily after it dries out. 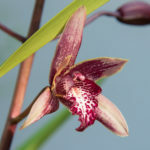 I hope that this successful experiment inspires you to try some different mounts for amenable species and orchids. Different species and genera have different preferences. We still leave our Barkeria bare rooted on mounts with good growing in our climate. 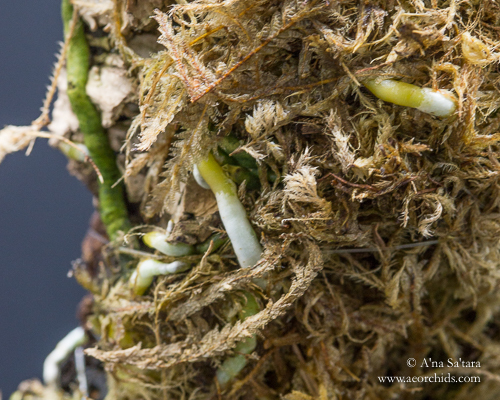 Another highland Mexican species, Alamania punicea, has a small “moss ball” attached to the top of its stick, rather than placed over the roots. The ball of moss appears to increase humidity in proximity to this miniature species, but the roots themselves are exposed. 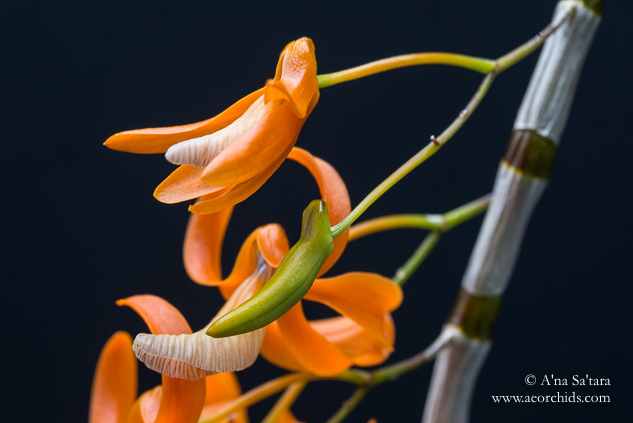 May Update: the Dendrobium unicum has flowered beautifully this spring: check out the amazing orange in these orchid portraits!